Former PPP/C minister Ganga Persaud has denied that there was any abuse or irregularity surrounding a contract with the Ministry of Labour or any other agency and says he completed the requirements stipulated under the said contract and should be paid. Persaud, in a statement responding to a story published on the online news agency Demerara Waves, said that he was contracted by the Ministry of Labour and the contract came to an end on May 31st and he has since requested payment. On Thursday, Minister of State Joseph Harmon told members of the media that there were more instances of unacceptable practices involving persons from the previous PPP/C administration. He named Persaud as one of the persons ensnared and said that it involved the then Ministries of Labour and Youth, Sports & Culture. When approached by Stabroek News, Minister of Education Dr Rupert Roopnaraine, under whom the culture and sports departments now falls, confirmed that an ongoing audit is discovering what appears to be irregularities but declined to give further details. For her part, Minister of Social Protection Volda Lawrence, who now has responsibility for Labour, had told Stabroek News that Persaud’s request for payment amounting to millions of dollars for the contract he executed under the co-ops department, triggered an ongoing investigation. She had said that she was shocked because the department is in a mess but Persaud has since been written to and asked for a report. However, Persaud, in his statement, said that the minister would be unable to locate a report from him and neither can one be requested, as the contract does not stipulate him to do such. (a) Provide advisory service to the Cooperatives Division of the Ministry of Labour on handling the winding up process of defunct cooperative societies. (b) Provide advisory service to the Cooperatives Division of the Ministry of Labour on the handling of management issues encountered by cooperatives societies in difficult circumstances and its impact on the functioning of the Cooperatives Division. (d) To coordinate with other Ministries and Agencies…to gather information to fulfill the Ministry’s obligations to report to the International Labour Organisation on ratified conventions. He said that he fulfilled the requirements and requested payment since the contract came to an end on May 31st and he did not express an interest to renew it. “I provided the services for which I was contracted and this can be verified by the Chief Cooperatives Officer. I had almost weekly face-to-face meetings with her and another senior staff in the Division. 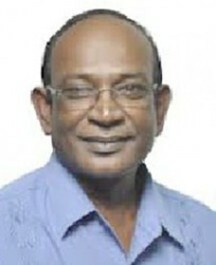 We collectively made several decisions which were implemented over the period,” Persaud said.